At Yalta, trump would have said, "Do you want more than Eastern Europe? Sure, take Western as well! I know who my buddies are!" trump would have resolved the Cuban Missle Crisis by saying, "Forget Cuba, I've got some great golf courses in Florida and NJ where you can park your missiles!" Or to Mr. Gorbachev, "Don't tear down this wall! Help us build one to keep Mexicans out. In fact, you could help us build a wall around all the blue states that don't vote for me!" "You want Ukraine? How 'bout we just turn over NATO to you?" 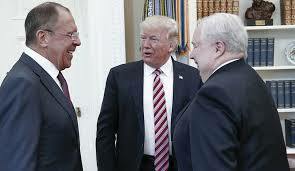 "You guys have prisons, could you lock up Hillary for me, please?" "You guys know how to take care of pesky reporters, don't you? Could you help me out with this list?" "I can do whatever I want. Because when you''re President, they let you get away with everything!" "When the president does it, that mean's it's not illegal."